Guaranteed to get muddy, if used correctly! We love to see our products in action, so since we started back in 2005, we have run a series of photo competitions for our customers, and now we have announced our Spring 2017 winner!! Caroline sent us a great picture of her children all lined up in waders, handed down through the family. Merryn, Rewen and Alexandra all looked to be having great fun rock pooling on the beach near their home. Nothing beats our waders for puddle proofing !! We are running another competition ending in June 2018, so keep taking the photos, and keep sending them in or posting them to our facebook page , as any contributions received in the meantime will be automatically entered (click here for terms). We have stocked Original Wristies for kids and adults for years, but unfortunately our supplier in the UK ceased to trade.Our customers (and us too) loved them so much that we have brought them in ourselves from America, with more choices in colour than ever! Perfect for warm hands year round with fingers free for the fiddlest of activities, once you've tried Wristies, you'll be hooked!! 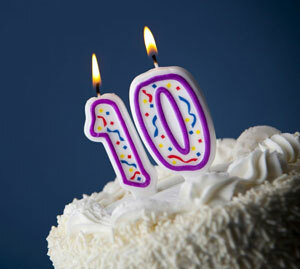 Exciting times for us - we are celebrating our 10th year of business this summer! Thank you to all our loyal customers over these years. To mark the anniversary, we have finally made updates to our website to make it more mobile and tablet friendly. We hope you like the changes! It has been great to see how the importance of outdoor play in child development has grown in recognition over these last 10 years. We have particularly enjoyed working alongside schools and forest school groups to bring outdoor learning into the regular activities for young children. 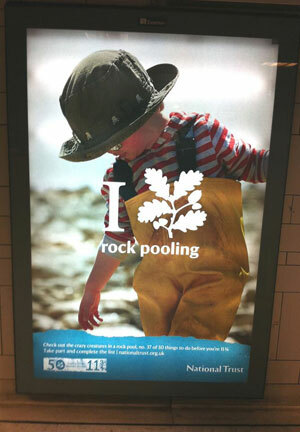 We were excited to find the National Trust using our kids waders in their ' I ♡ rock pooling' advertising campaign to get kids out and about. We think that they are an excellent choice; perfect for rock pooling, and exclusive to us! We have just added the Trespass Button All in One Rain Suit & the winter, thermally lined version Drip Drop to our range. Both waterproof & breathable, they are available in sizes up to age 7/8years, which makes them ideal choices for Early Years and KS1 Outdoor Learning, and at a great introductory price of £17.99 for the unlined suit, and £26.99 for the winter lined suit. We are also currently offering a great special price on our ever popular Regatta Puddle Suits - at just £17.99 and a price of £26.99 on the winter thermally lined version of this suit! 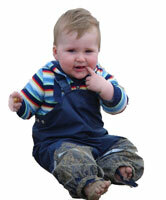 We specialise in outdoor play wear for pre and new walkers. See our Babies & Toddlers page for rain suits, rain coats or dungarees including the Togz range, Snow Suits and our Wellies page for first boots. Have a look at our great deals on ski jackets and winter wear. See our winter ski jackets, trousers and suits from Trespass & Dare 2b (including toddler snow gear). We also have a wide range of winter accessories including hats, socks, kids ski gloves and also kids thermals and kids mid-layers. Take a look at our School Coat pages for a great range of flexible kids back to school coats, jackets and rain capes, including our ever popular packaway jacket (so easy to keep in the school bag); our flexible reversible waterproof/fleece jacket at amazing value ( £23.99 inc p&p! ), and our very popular long backed school rain poncho to cover both child and school back pack with hi-viz reflective strips for safety too. Our commitment has always been to bring you high performance, practical and easy care clothing, to keep your kids active outdoors whatever the weather; and all at low prices with no hidden extras. We are proud to introduce you to Ocean Rainwear from Denmark; super waterproof, and a favourite with schools and groups - in the comfortable PU fabric so popular with Scandinavians, and with thousands of our satisfied Waterproof World customers too. And introducing Playshoes from Germany. 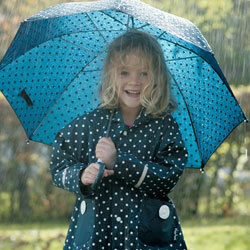 Eco-friendly fabrics, and in great designs with matching wellies and umbrellas too. Look out for our great 'deal' price of rain cape (poncho) or jacket and umbrella together! Waterproofs for Mums & Dads! We were always being asked if we have anything for parents - often by Mums with lots to think about in a short time before a big trip or holiday. In response we' added some super practical packaways for grown ups to our range and a longer length jacket. We know that when you've a 'to do' list as long as your arm, getting the whole family's waterproofs sorted out in one go can make life simpler - especially with our service and fast delivery to rely upon! As a result of our involvement with schools and groups, we forged a close alliance with the School Grounds Charity, Learning Through Landscapes (LTL); working alongside them in promotion and development of outdoor learning. We were honoured to be asked by them to showcase a selection of our products within the Growing Schools Garden at the RHS Hampton Court Flower Show. 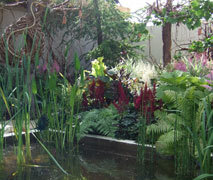 The garden was designed by TV gardener Chris Beardshaw and co-ordinated by LTL, and it won both gold medal and the coveted Tudor Rose (best in show) award. Our display was included to highlight the importance of all-weather clothing in quality outdoor play and learning. Read more about the garden here.